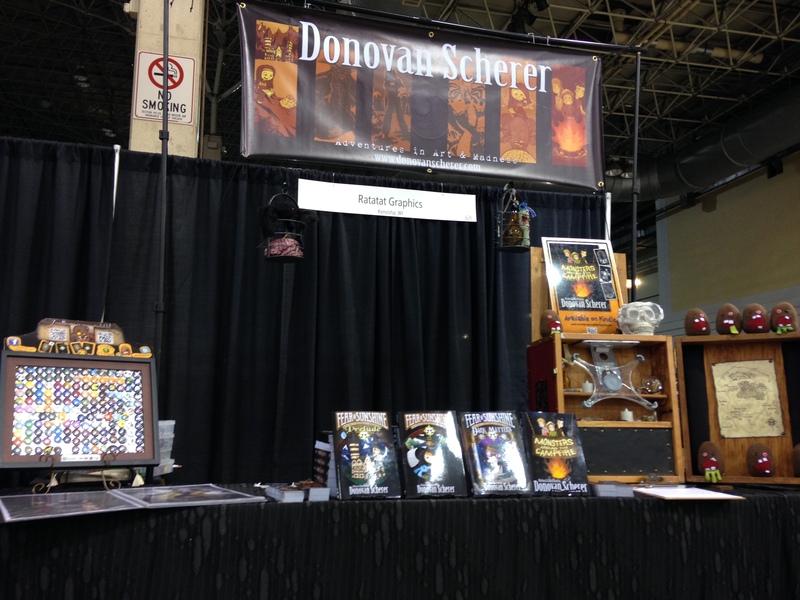 For anyone considering bringing their work to the world of comic conventions, here’s a behind the scenes of how and why I set up my table the way I do. The main thing I want to sell at shows are my books. I could just bring them along, lay them out on the table and see what happens. There could be the curious reader who may walk up, but since I’m pretty unknown and want to get my work out there, I’ve got to step up my game. Standing out in the sea of artwork at a comic convention can be hard. Your table may be placed next to someone with a ten foot tall wall of art prints. 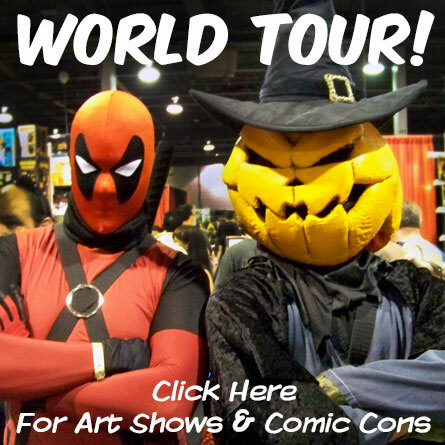 You might be set up next to a world famous comic book artist with decades of work on display. So, how do you compete? For all my self-publishing friends out there, you know that your book cover is one of the most important tools you have to sell your book. The table setup has a lot of similarities. If you don’t have tons of stuff to sell at the show, use all that space to support what you do have. For authors, you can add things that support your genre. If you’re writing fantasy, add some cool, hand-drawn maps. Horror writers could put up missing posters for some of the victims of their stories. Steampunk? Gears. Gears, everywhere. Let people get an idea of the genre of your work with just a glimpse. For me, I have a couple little cages hanging from my banner stand. One has a plastic brain and a big, furry spider. The other has a voodoo doll and a bottle with some mystery creature in it. When people spot them and ask what that’s all about, I tell them I deal in mad science. Then, I show them the books. Everything happening at a convention can be major sensory overload. With all the people gathered together, all the cool things to see, and every artist and merchant trying to pitch their product, it can hard to get people’s attention. Something I’ve found that helps a lot is to bring the calm. While I do have plenty of eye-catching weird stuff to look at, I’ve found that by keeping a big part of your table setup, the background in particular, open and empty, you can give people’s eyeballs a much needed break. For the sides of my table, I have the stuff that does the most to draw in eyeballs. Both the ZomBeans and the buttons are things that people can see from a distance but want to come closer to have a better look. If the person is looking at the ZomBeans, wondering what those weird little things are, I tell them the beans are from a game I made and point them to the video playing on the iPad. In the video, that’s where they get a better glimpse of the characters from my books. That’s when I introduce them to Fear & Sunshine. Over on the other side, we’ve got the buttons. If the customer is really scoping out what’s available, they’ll probably buy one. Otherwise, I point the book of prints below the button display. As they’re flipping through, it goes from fan art to artwork from the books. I tell them those are my characters from the stories I write and illustrate, which just so happen to be sitting right next to them. At this point, the display has drawn in your potential reader and now it’s time for your finest sales pitch. I recently had a fun conversation about comic cons, children’s horror, and gathering the souls of readers to form an army. Click here to listen in on the Fun with Fiction podcast. The interview is with Luke Morris, one if my internet pals that I just got to meet in person at the Mighty Con show in Dupage. He’s another indie author out there scaring kids with his work. 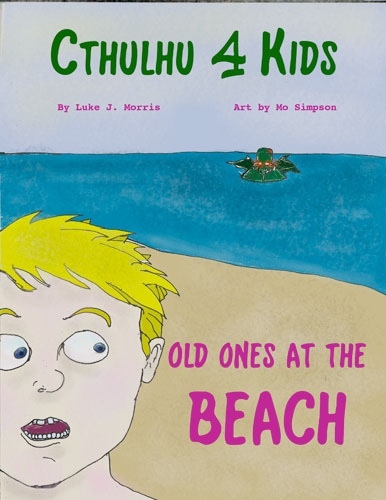 Check out his series Cthulhu 4 Kids, a story about a super weird little dude named Milo and his playdate with everybody’s favorite tentacle-faced Old One. If you’re a writer, the Fun with Fiction podcast is a good one. While it does go into the business side of things for authorpreneurism, it also talks a lot about the craft of writing. While my main influences are cartoons and PEZ, it’s cool to hear from people that read book-things. I think I’ve just about got every show that I’ll be doing planned or booked. A couple of road trips, a few I’ve never done before, and of course, a whole of of business as usual. And hey! 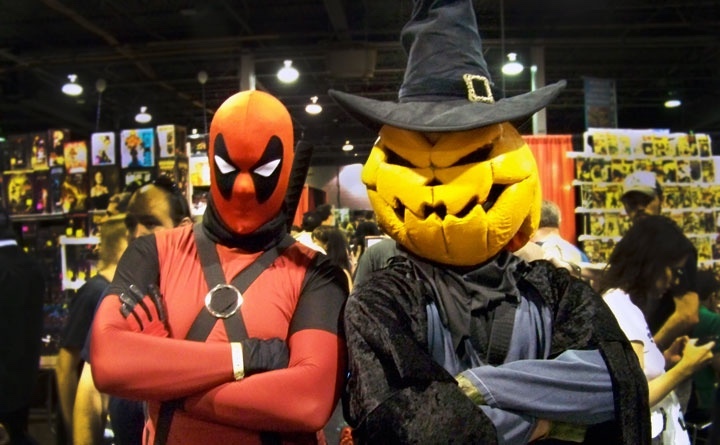 Wisconsin has a Wizard World show now! It is in prime hibernation time, but whatever. 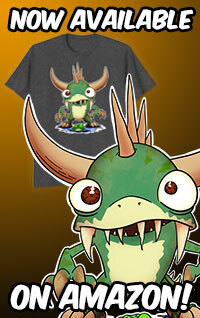 Let’s nerd it up! There’s a new calendar page on this site that’ll have the most up to date information for upcoming events. I’ll probably announce any new shows as they pop up or when they’re coming up, but that page will be the house to it all. So, check out all the details on the Calendar and start planning 2015. I better hurry up and write some more books.